No bake desserts are perfect for summer, and nothing is more perfect than this No Bake Strawberry Pretzel Salad Pie! So I first had the traditional Strawberry Pretzel Salad a few years back at a 4th of July party. It was made in a 9×13″ pan, pretzel crust, creamy cheesecake filling, and topped with strawberries and Jell-O. The thing, to be honest, scared the heck out of me. And then I had a bite and I was HOOKED: salty pretzels, creamy sweet cheesecake, and yummy strawberries. The one thing I could never get past with that dessert was the gelatin. I’m just not a Jell-O fan, never have been. So that’s why, when I reinvented the dessert as a dip last year, I used strawberry pie filling and I pretty much inhaled the entire batch. So this summer, when I was trying to think of a delicious summer recipe, I wanted to make the salad again…but as a pie. Whether or not it’s a salad is something I’ll just ignore. Hey, who am I to contradict the nice Southern ladies who invented this dish in the first place? If they wanted it to be called a salad, then by all means that’s what it is. It also means I can have TWO slices. I know it all sounds weird together. Like, pretzels, cheesecake, and pie filling? What the what now? But, you guys. It works. It’s salty, sweet, NO BAKE and the perfect potluck dessert. When you make a no-bake cheesecake, you have to start with the best ingredients. I said this last month and I’ll say it again: I’m LOVING Challenge Cream Cheese. Where it says smooth & silky there on the box? #TRUTH You guys, I never even let it come to room temperature. I just open it and start making my dessert and it’s totally creamy and not lumpy. The crust is made with pretzels and melted butter. I used Challenge butter. Remember how I said my dad won’t eat any other kind? Still true. He was sure excited when I told him I was working with them, especially since they’re a local-to-us company in the Bay Area. And it doesn’t hurt that Challenge Dairy is the only dairy company in the U.S. that controls the whole process: it’s their milk and their production factory/distribution that gives us these stellar products. Let’s talk about PRETZEL CRUST! I’ve been wanting to make one FOREVER. This crust has three basic ingredients: pretzels, sugar, and melted butter. I crushed my pretzels in a food processor, but you can also use a rolling pin. The finer they are, the easier the crust sticks together. And it sounds like a lot of butter for the amount of pretzels, but those babies can soak it up. 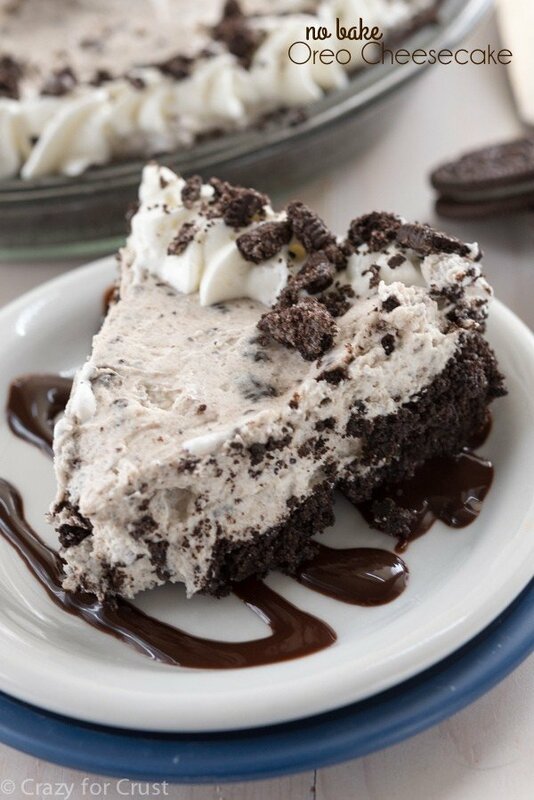 This crust is not only perfect for this pie, but it would be perfect for a peanut butter pie too! 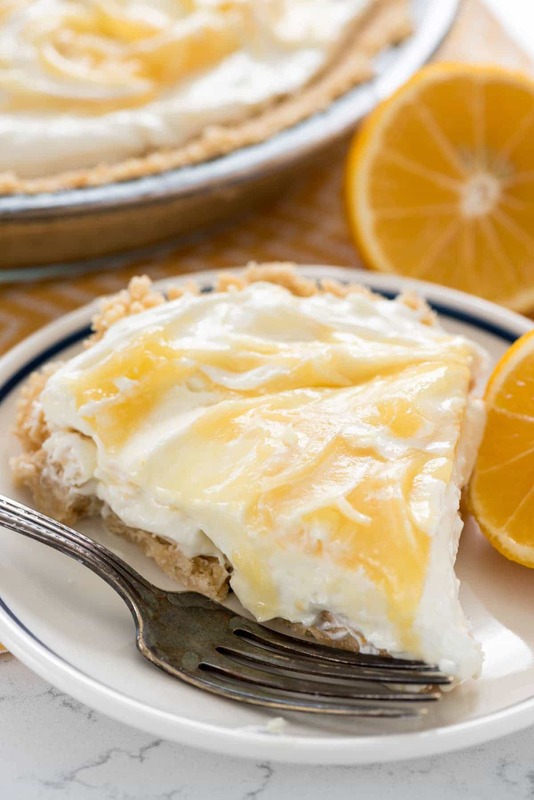 Let’s settle the GREAT NO-BAKE PIE DEBATE: to bake or not to bake the crust? My vote? NO BAKE. If I’m making no-bake cheesecake filling I don’t want to turn my oven on at all. In fact, I never bake any of my crumb crusts; they don’t need it. Chill them after you press them into the pan, then fill: COMPLETELY no-bake. Once the crust is done, we fill the pie! I made an easy no-bake cheesecake recipe with cream cheese, sugar, and whipped topping. You can use real whipped cream if you want, but the whipped topping was easier (and it lasts longer set in the pie). The Challenge Cream Cheese whips up perfectly in this and produces the best no-bake cheesecake ever. Now, once you have your crust and your filling (which would also be good with a graham cracker or and Oreo crust), you top it. Since this is a Strawberry Pretzel Salad Pie, I topped it with Strawberry Pie Filling. You could also use cherry, or apple, or peach…or just leave it plain. Or douse it in chocolate! 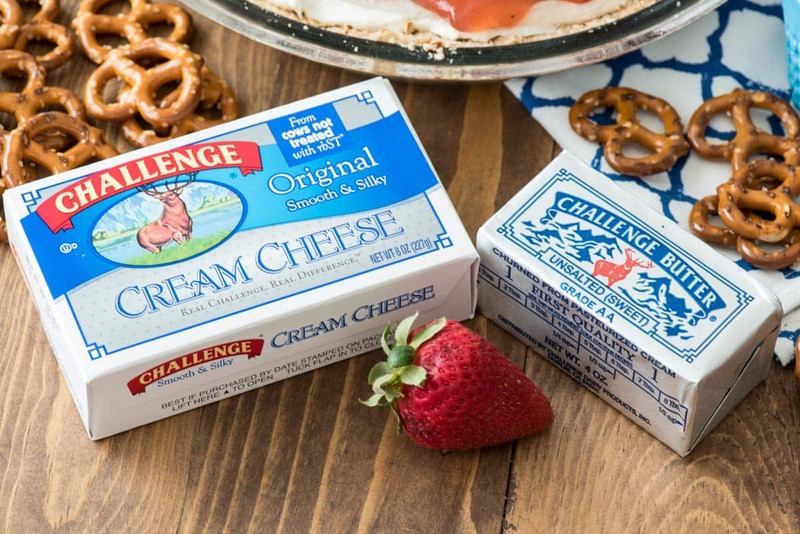 Challenge Dairy is also hosting a Real Summer, Real Flavor Sweepstakes where you could win a grand prize of $100,000, butter and cream cheese, cooking products, and more! Check it out here. 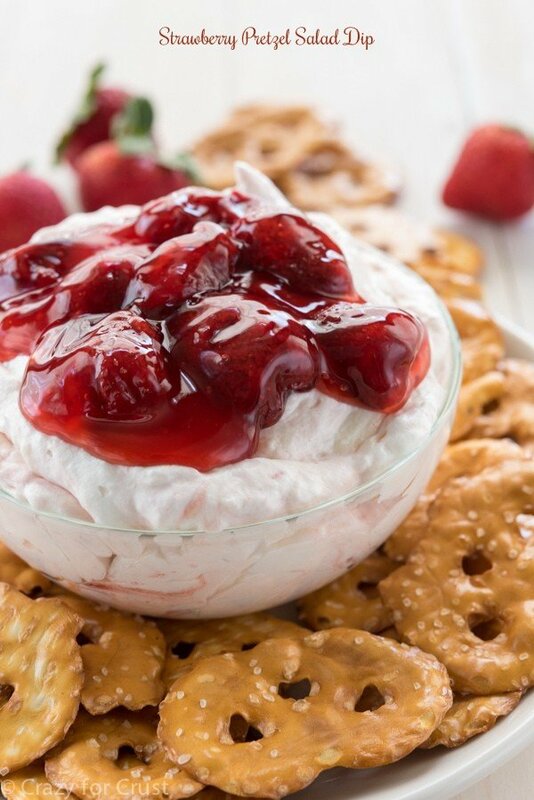 This No-Bake Strawberry Pretzel Salad Pie turns the popular Jell-O salad recipe into a pie! 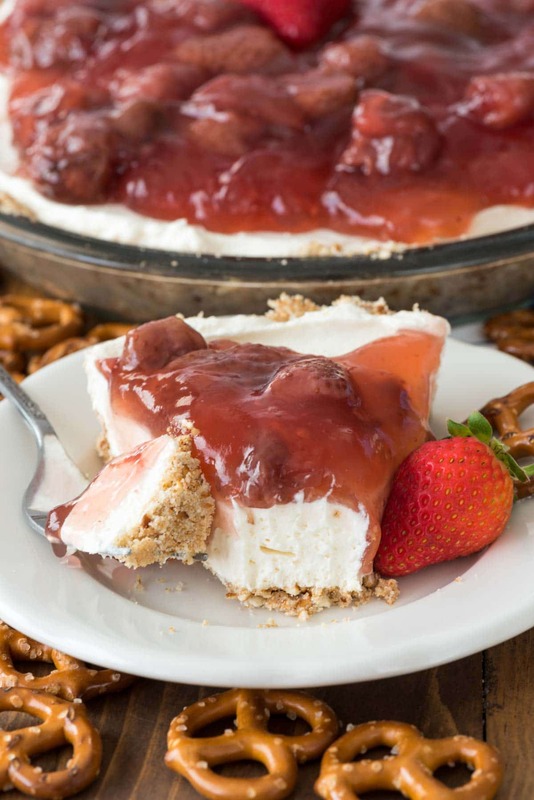 No bake cheesecake, pretzel crust, and strawberry topping! Make the crust: stir finely crushed pretzels and sugar with melted butter. Press into a 9” pie plate. Chill until ready to fill. Make the filling: Beat cream cheese, sugar, and vanilla until smooth. Whisk or fold in whipped topping until no lumps remain. Spread in prepared crust. When ready to serve: top with strawberry pie filling or chopped strawberries. This post has been sponsored by Challenge Butter. All opinions are 100% my own. This looks amazing!! My Midwestern family always makes the jello salad version, but I’m vegetarian and don’t eat gelatin so I’ve been looking for a way to eliminate the jello. Strawberry pie filling is perfect! 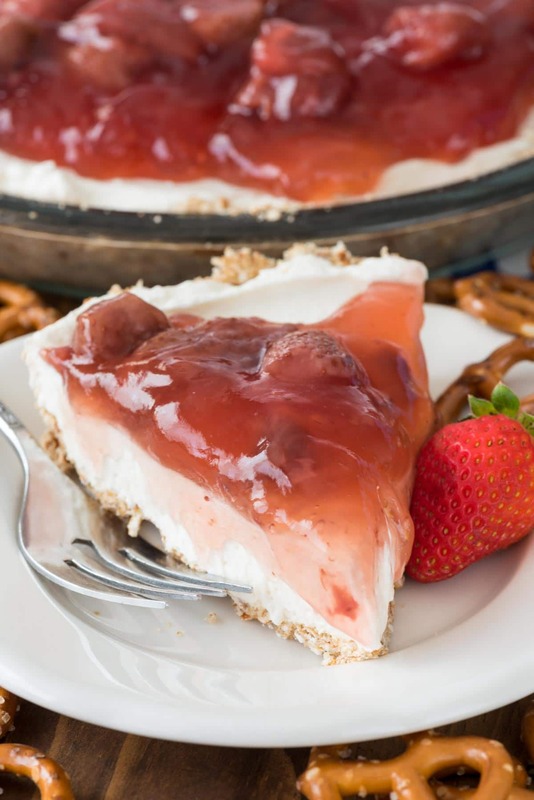 Is there any way to make the strawberry pretzel salad pie for diabetics? No I haven’t made it yet. Make the real recipe (not this jammy pie filling thing) and use sugar free ingredients, Splenda instead of sugar, sugar free jello, and sugar free coolwhip.. I do it that way for my diabetic hubby. I don’t like it but he loves it.